There’s a quiet panic rippling around Hammersmith Town Hall. The Conservative Administration had planned to demolish the cinema, demolish the Pocklington Trust homes for the blind, demolish the Friends Meeting House and then build a supermarket (probably a Tesco), two fourteen storey blocks of flats, an ugly bridge into Furnivall Gardens and luxury offices for bureaucrats. But Hammersmith’s residents don’t like it. Now as far as this administration is concerned there is a problem with residents – they’re also known as voters. So, under vast amounts of pressure the Conservative Administration buckled and has supposedly beaten a reluctant retreat. But have they retreated enough? I don’t think so. Indications from around the Town Hall are that they are strongly considering dropping the bridge altogether and expect to remove no more than five floors from each of the skyscrapers. That done, they will then tell the public that they have listened and crack on with their still unhappy plans over the next six months. But most of the rest of the development still stands. So here’s what really needs to happen to genuinely improve the scheme. Firstly, lose the offices. We don’t need them!.. And the cost being paid by our Council to plan, design, build and deck them out is around £35 million. 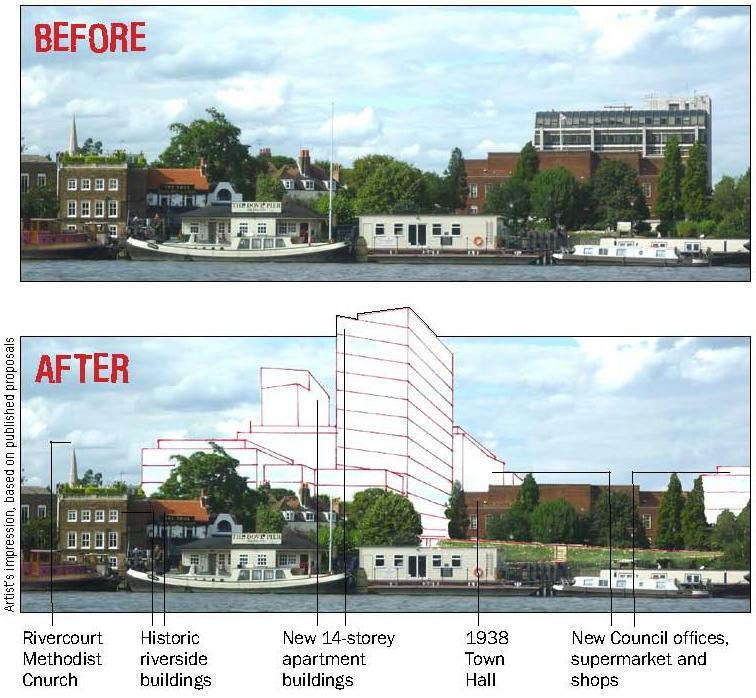 Lose them and we can have a smaller scheme that regenerates that part of Hammersmith without blighting the skyline for generations. Secondly, a new plan is needed that has the input and support of Hammersmith’s residents. That should see the demolition of the current ugly extension (also built by a Conservative Administration). It must also seek to adapt the front of the Town Hall using retail and community recreation space to draw people in. There is no need or desire to demolish people’s homes in Pocklington Trust or to demolish the cinema so the new proposals should protect these local assets. Finally, and possibly most crucially, there is a problem with the senior officials and politicians working on the scheme. They are deeply and emotionally committed to much of it. I believe the senior team has lost all perspective and this affects every aspect of their judgement on this matter. I also believe that many of the officials negotiating with the developers are completely out of their depth. The Administration needs to bring in new people who will take a fresh and competent approach that seeks to rise to residents’ hopes rather than remove one or two items they both fear and loathe.